Lake Albemarle Now Open To The PublicAfter months of construction with numerous weather delays and fluctuating lake levels, the dam, boat landing and courtesy pier renovation projects are completed and the lake is open to the general public (including boaters). Thank to everyone for their patience while waiting for the completion of this project. Lake Albemarle is a 35-acre impoundment owned by the Virginia Department of Game and Inland Fisheries. Built in 1938 by the Civilian Conservation Corp, this lake shows little sign of aging. The shoreline is virtually undeveloped and due to its location in the foothills of the Blue Ridge Mountains, Lake Albemarle provides a quality aesthetic outing. The lake supports a variety of sport fish including self-sustaining populations of largemouth bass, bluegill, redear sunfish, and black crappie. Channel catfish are stocked annually by the Department to diversify the fishery. To visit Lake Albemarle, travel west on Barracks Road from Charlottesville. Barracks Road becomes Garth Road (Rt. 614). Continue on Garth Road to Albemarle Lake Road (Rt. 675), approximately one-half mile before the town of White Hall. There will be a “PUBLIC FISHING LAKE” sign at the intersection of Albemarle Lake Road; turn left and follow the signs to the lake. Alternatively, from the Route 240/250 junction near Crozet, take Route 680 and 810 to White Hall, then east on Route 614. Turn right on Route 675 to the lake. Largemouth can be found along the shoreline in shallow water during early spring as water temperatures begin to warm. Spawning season is primarily in the month of May and bass are generally feeding heavily several weeks prior to the spawn. Fallen trees and beaver lodges are good areas to fish for bass at this time of the year. As water temperatures increase during the summer months, bass move to deeper water and tend to be more active in early morning or late afternoon. As fall approaches, with cooling water temperatures, bass move back into shallower water, taking on feeding habits of the early spring months. As winter approaches, bass once again move to deeper water. Sunfish are the primary forage for bass in this lake. Lake Albemarle has always had a good panfish population that has provided anglers with many hours of enjoyment. Sampling indicated that the bluegill and redear populations continue to do very well. Bluegill, redear sunfish, and an occasional warmouth exceeding eight inches are not uncommon in this fishery, and bluegill growth rates are above the statewide average. Sunfish spawn in this lake in May and June and can be found on spawning beds in shallow flats. As summer approaches, the panfish will move to deeper water – as do the bass. In the fall of the year, bluegill and redear will once again begin to spawn as water temperatures cool, making them once again vulnerable to fly fishing with popping bugs. Crappie fishing in Lake Albemarle is decent, with fish up to 12 inches being available. These fish can be located in the lake in areas that have fallen tree cover, beaver lodges, or one of the 15 submerged log cribs that were built when the lake was first impounded. Live minnows or small beetle spins are excellent bait for crappie, which may even land a small bass or the larger sunfish. Channel catfish are stocked annually in Lake Albemarle. Late evening till dusk from May through September should provide some good fishing for channel’s using stink baits. Currently, there is no size limit on this species. There is a daily creel limit of 5 bass per day. There is no size limit for sunfish in Lake Albemarle. Anglers may keep up to 50 sunfish per day. Effective January 1, 2014; crappie will be managed by a 10″ minimum length limit. Anglers may keep 25 crappie per day. There is no minimum size limit for catfish in Lake Albemarle and anglers may keep 20 catfish per day. NOTE: Swimming, sailing, wading, and trotlines are prohibited. Fishing involving prizes is also prohibited. Fishing is permitted from 1 hour before sunrise to 1 hour after sunset. Trapping by permit only. Nets, seines, and gasoline motors are prohibited except for official Department duties. A boat ramp and loading pier is located on the lake off Route 675. Shoreline access is also available at various locations along the eastern (northern) perimeter of the lake as well as at the dam. There is one fish attractor on the lake marked by a floating buoy. 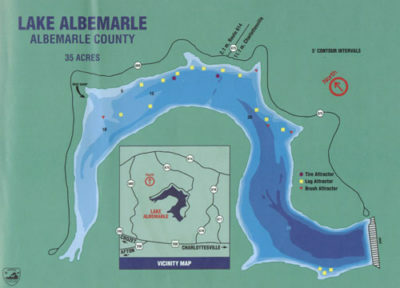 Lake Albemarle has an interesting history. Built in 1938 by the Civilian Conservation Corp (CCC), this 35-acre lake was one of the first public lakes in Charlottesville and Albemarle County. The dam is very well built and all of the best state-of-the-art techniques were followed in its construction, which included clearing all vegetation from the area that would be flooded. After clearing, 15 log cribs were constructed around the lake to act as spawning areas for bass and cover for catfish. These cribs still exist after 50 years. Additional attractors, consisting of old tires and cedar trees, have been constructed over the last 20 years. Only one attractor is marked and is located near the boat ramp. It consists of the steel framework of an old diving platform, enhanced with numerous recycled Christmas trees and piles of cinder block. The Virginia Department of Game & Inland Fisheries owns and manages Lake Albemarle. Fisheries management historically has consisted of stocking various species of fish to increase the variety of game fish in the lake. Muskellunge, tiger musky, and walleye were stocked for many years but stocking of these fish ended in the late 1980’s and early 1990’s and these species are no longer found in the lake. Today, channel catfish are stocked annually and all other fish species found in the lake are sustained by natural reproduction. Fish populations in the lake are managed to provide the best possible angling for bass, panfish species, and channel catfish. Sampling is routinely conducted every three years to determine population dynamics and then recommend any necessary regulation and stocking changes. Until the late 1980’s all sampling consisted of boat electrofishing to collect largemouth bass and intensive use of trap nets for bluegill, redear, and crappie – essentially all panfish. Over the last 10 years bass and panfish have been collected exclusively by boat electrofishing in May of each year. Lake Albemarle has always had a good panfish population and has provided anglers with many hours of enjoyment. Sampling indicated that the bluegill and redear populations are doing very well and should continue to support an excellent fishery. Plans for the future at Lake Albemarle include improving access to the lake for all visitors. The parking lot, boat ramp, and courtesy dock should be improved whenever funding becomes available. The fish population will continue to be monitored to ensure that anglers have a good angling resource to enjoy.